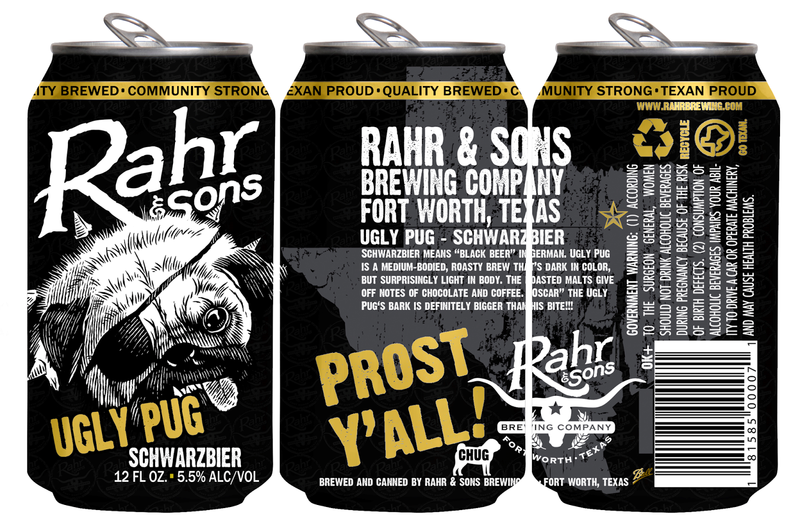 Image courtesy of Rahr & Sons Brewing Co.
As part of a continuing effort to meet the growing demand for craft beer in cans, Rahr & Sons Brewing Co. will transition Ugly Pug from bottles to cans in September. For those that aren't familiar, Ugly Pug is a schwarzbier that features flavors of bitter chocolate and coffee. It's one of the brewery's original year-round offerings, and it's a beer that gets its name from the way founder Fritz Rahr once described his mother-in-law's dog, Oscar. Commenting on the news, Rahr indicated the change is about keeping up with the times, while also ensuring that the brewery is delivering a quality product to consumers. "Rahr & Sons remains committed to creating delicious craft beers, while evolving with the market," said Rahr. "Cans are more portable, eco-friendly and they prevent unnecessary light and oxygen from breaking down the hops in a beer." To promote Ugly Pug's release in cans, Rahr & Sons will utilize the tagline "Chug a Pug" on pint glasses, t-shirts and posters, with a special tour and tasting to be held at the brewery to celebrate the launch on Wednesday, September 21 from 5-7:30 p.m. All attendees will receive a "Chug a Pug" pint glass, with proceeds from the event benefiting DFW Pug Rescue. In addition, food trucks in attendance will prepare dishes made with Ugly Pug, and Oscar himself will be on hand and available for photo opportunities. Labels: canned beers, Fort Worth, press release, Rahr & Sons Brewing Co.